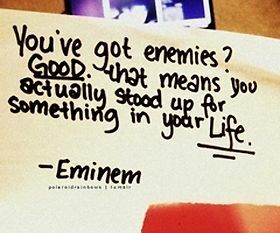 It takes a great deal of bravery to stand up to ones enemies, but a great deal more to stand up to ones friends. Show your enemies that your setback is temporary and that when you comeback you're going to be better than you were before. Enemies are people who are hostile to you and never wish for your progress or betterment. Enemies are each other’s foes, who are always plotting schemes to outdo each other, on several fronts. Enemies, at times, can’t even stand each other’s sight. In the words of Abraham Lincoln, “A friend is one who has the same enemies as you have.” Abraham Lincoln used to reduce the number of his enemies by making them his friends. You make enemies either by having a verbal or physical encounter with someone, on some pretext or the other. 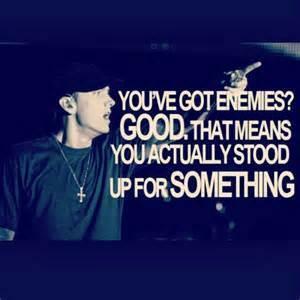 At times, when you take a stand and firmly support a just cause, you end up making enemies. In this context, the words of Winston Churchill deserve a special mention. He had once remarked, “You have enemies? Good. That means you have stood up for something, sometime in your life.” Never turn someone’s enemy, always make friends and contacts.